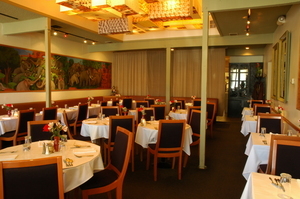 Ajanta’s dining room. Photo by Athena Azevedo. Badal jaam (eggplant). Photo from Ajanta. 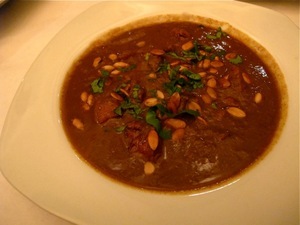 Kerala lamb masala. Photo: © tablehopper.com. 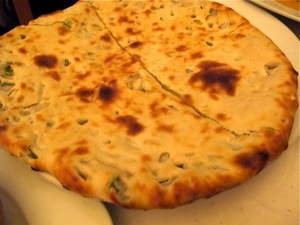 Onion kulcha. Photo: © tablehopper.com. I love when you walk into a restaurant and the smell is the first thing you notice (well, in a good way), swiftly followed by a pang of hunger. ~AJANTA~, with its lightly spiced aromas coming from the kitchen, is one of those places. The restaurant opened in Albany in 1993, and chef-owner Lachu Moorjani has definitely kept pace with the times. The restaurant is not only green-certified, but it also now uses all-organic vegetables and chicken, sustainable seafood, and hormone- and antibiotic-free meats. Which is all great, but then there’s the big question: how does it all taste? Well, that’s why you’re reading this review: this place knows all about delicious. First, I love the concept behind the menu: dishes from all over various regions of India get swapped in each month, and then retired for a minimum of two years until they are put back into rotation—or not. Lachu and his wife, Shanti, travel to India every year, visiting a different region each time and exploring the dishes of that place. You’ll definitely want to engage Lachu in conversation about the menu—he’s very exacting, obviously passionate about cuisine, and committed to doing things “the right way,” as he likes to put it. And to think he was formerly an engineer—now he’s all about engineering dishes. Some popular plates are permanently on the menu, like the tandoori chicken chaat ($6)—served slightly chilled—with shredded chicken tossed with lime, red onion, cilantro, ginger, and spices; it was like an Indian larb. Vegetarians will want to try the meaty portobello mushrooms ($6), thick slices that are marinated and grilled in the tandoor, and then served with a creamy yogurt-cashew-mint sauce. I will admit I was skeptical about portobello mushrooms used in an Indian context, but I’m glad the kitchen sent the dish out—it was inventive and the flavors worked, with a whisper of cinnamon and clove. I have stopped ordering samosas after my travels in India—stateside, they are often tough and taste like they were fried two days ago. But the two versions here got me back on the samosa train, with their tender and flaky pastry exterior. The chicken version ($5.50) had deeply flavorful seasoning, while the vegetarian version ($5) featured red potato inside, lending a creamier impression. Couldn’t decide which one I liked more. Another standard that’s a must-try: the lamb rib chops ($19), so tender from their time marinating in yogurt, and served on a sizzling platter. Remember, it’s totally cool to pick up the chop with your fingers at the table. You have my blessing. Our table was laden with an embarrassing number of dishes to try (I blame Lachu). A favorite was the tender vegetable kofta ($14.50)—this dish from Uttar Pradesh was such a star. The little patties were almost like mini falafel made with potato, peas, breadcrumbs, cauliflower, and carrot, served in a creamy curry sauce with cashews. 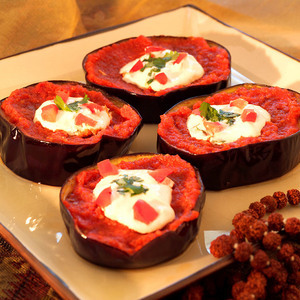 The badal jaam ($14.50), thick slices of pan-fried eggplant brushed with tomato sauce, spiked with spices, and drizzled with thickened yogurt on top, gave me the impression it was a dish from Greece that took an exciting trip to India. A third standout was the daal bahar ($14.50), a hearty and creamy lentil dish with complex seasoning, and chock full of vegetables that were cooked just right. Yeah, if you’re a vegetarian, this place is going to thrill you. Ditto if you’re a meat eater. And the kitchen is happy to make adjustments for vegans, so everyone wins. The Kerala lamb masala ($17) was full of tender bites of lamb simmered in a richly spiced sauce, creamy with coconut milk, perfumed with clove and coriander, and topped with pumpkin seeds. It was perfect for a chilly night, even if it didn’t taste particularly unique. The only clunker was the methi machi ($17), ling cod in a tomato-based sauce perked up with fenugreek and dill—we loved the sauce, but the fish was weighing a bit on the fishy side of things (would that be the fish scale? Har.). And you’re talking to a girl who loves mackerel, anchovies, and sardines. I know, you may be thinking, “Damn, those prices look a little high.” Well, you also get basmati rice, a side dish, half of a naan, chutney, and pickle (achar) with that price. Yup, a full meal deal, all made with quality ingredients, and you don’t even have to order it by a number. There’s also a special dinner option, which would include a samosa and dessert, ranging from $17.50-$20, depending upon which of the six main dishes you choose from. Trust, you won’t walk out of here hungry, I don’t think Lachu would allow it. You’ll want to do an add-on and mop everything up with their superb onion kulcha ($3). I found the whole wheat paratha ($2, $3.50 with potato), perked with ajwain seeds (a cumin-like seed) to be a bit too wheaty for my taste, but maybe some of the Berkeley types are into it. (Hey, I’m allowed to make Berkeley jokes, I live in San Francisco.) If you like it spicy, you can request what level you want your food at (go ahead and err on the spicy side), but heat lovers should ask for their fiery hot sauce on the side as well. You can always cool your maw down with a salted lassi. Something of note: I felt like the dishes were made with a lighter hand; even the next day, when warming up what remained of my leftovers, I noticed very little oil in the takeout box and pan. 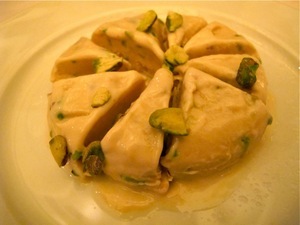 Dessert featured a revelation: the kulfi ($6) with pistachio. It’s another dish I have stopped ordering out, often finding it to be too cloying with the sweetness from condensed milk, or too crystallized. This version—made with milk and cream and cooked slowly for over three hours—was neither of those things. It was very creamy, dense, and lightly hints at the flavors of cardamom and keora, the Indian version of pandan. The wine list has some food-friendly wines (and wallet-friendly as well), but I’m always a little sad when I see Freixenet as the only sparkling wine available by the glass, which is something I love to drink with Indian cuisine (especially a sparkling rosé). I’d love for a wine consultant to really come in and pimp their list. The dining room has a contemporary look, with paper and tablecloth topped-tables and cloth napkins. It’s very comfortable, and even though some tables can be a bit close (our nosy neighbors had plenty of comments about our table o’ dishes), the room has a modulated volume due to the carpeted floor. There’s also low sitar music, and a glow from the overhead lightboxes with a pretty collage of artwork adhered to them. The staff (in spiffy vests) was kind, quick to clear plates and check in. The room had a very 510 crowd of Cal professor types with their spouses, mixed in with diners that looked to be grad students (or at least that age). It would be a charming place for a first date, but also a nice place to bring the ‘rents. Be sure to sign up for their newsletter, which features updates and the backstory on the new monthly dishes. And if you’re inspired to try some of these dishes yourself, the restaurant sells a namesake cookbook (Ajanta, Regional Feasts of India) with complete menus from various regions, and an accompanying Shanti’s Spice Box to make the ingredient acquisition a bit easier ($25 for the book, $28 for the spice box, and $48 for the set). Although a big thing missing would be Lachu, checking in on your table and smiling at you as you clear your plate. Share your thoughts and read more on Deep Dishing!